The busy streets of London are filled with bars and eateries, which serve all budgets. Some people prefer to keep to a budget set by the small pubs and market stalls, whereas others prefer to splash the cash. Here we look at the upper end of the scale as we delve into the luxurious world of wining and dining in London. Whether you are celebrating something special like a birthday, an engagement, an anniversary or just want to spoil yourself, London offers incredible culinary wizardry. The city is home to many impressive and innovative chefs and it has even been dubbed the culinary “Capital of the World”. What is the dinner dress code in London restaurants? As with afternoon tea, a smart casual dress code applies. However, some locations do require that gentlemen wear dinner jackets to enter. Reservations are strongly recommended at most locations; in some places they are mandatory. How much do I tip at restaurants in London? It is common practice for many high-end restaurants to add a 12.5% or 15% “discretionary” service charge to your bill. If you feel the service was not up to standard or you simply do not wish to pay it, you may ask for it to be removed as it is an optional extra. Below are some of our favourite luxury dining locations in London. 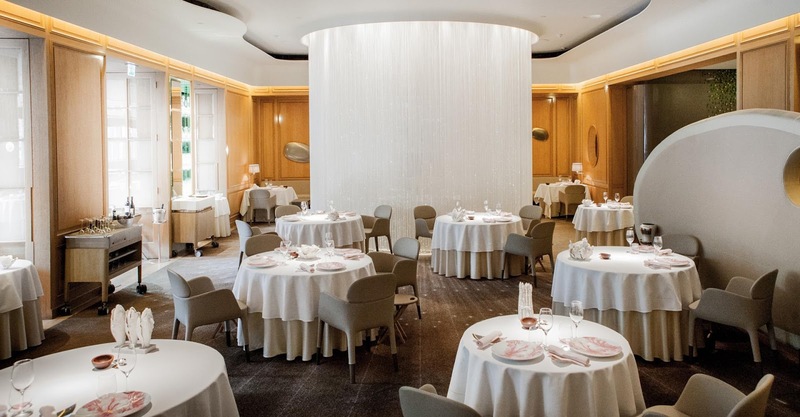 This three Michelin star restaurant headed by Chef Christophe Moret, offers top notch French cuisine and is a bit like stepping across the channel into France. The three-course a la carte menu starts at £95, four courses are £115, and a seven course tasting menu is £135. The lunch hour menu provides fantastic value, with a three-course meal including two glasses of wine priced at £60. A two Michelin star restaurant located in Mayfair, and partly owned by thirteen Michelin-starred chef, Pierre Gagnaire. Taster menus start from £81, while mains start at around £47. This is some of the most expensive food in London. The impressive wine list reaffirms the upscale nature of the restaurant, with wines prices all the way up to £17,000 a bottle. This French restaurant, opened in 2006 by the renowned French chef Joël Robuchon, applies several French techniques to an affluent combination of ingredients from differing countries all over the world. This two Michelin star restaurant, offers meals that can easily top £200, as well as some more affordable options. The ‘Menu du Jour’ offered at Lunch and pre-theatre is priced reasonably at £38 for three courses, and £43 for four courses. On the a la Carte menu mains are priced at £25 to £51, with Japanese Wagyusirloin steak going up to £53 per 100g. The five-course taster menu starts at £95, with eight courses from £129. This is one of only a couple of restaurants in London that holds three Michelin stars. The restaurant offers some of the best culinary encounters in the country, and has been named the “Best Restaurant in the UK” on several occasions. A three course lunch menu is available for £65, with an all-day set menu available for £110. A seven-course Prestige Menu is £145. This two Michelin starred restaurant in Mayfair has made it into the top ten spots of the United Kingdom Food guide. It is owned by Chef Claude Bosi and offers incredible delights. The three-course set lunch menu is priced at £49.50. A ‘surprise’ tasting menu and a classics menu are both available for £135 a head. The restaurant sources indigenous British ingredients, including Cornish turbot and lamb from Somerset, through local suppliers. Other luxury restaurants of note are Le Gavroche, Hélène Darroze at The Connaught, The Greenhouse Restaurant, Marcus at The Berkeley, and Apsleys at The Lanesborough.